The Design Pane consists of the design area and an outlying unused area. 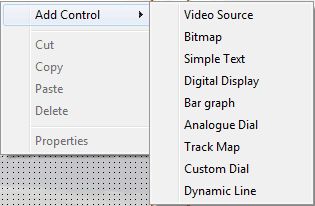 You can place controls on the design area. The width/height ratio of this area is adjusted to suit the screen size of the selected video standard (PAL or NTSC). The area contains three concentric rectangles that define the edges of the title safe, action safe and invisible (overscan) areas. It is recommended that controls be placed inside the title safe area. 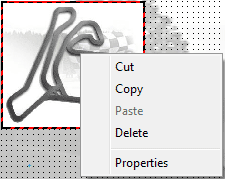 Paste – This will be enabled if a cut or copy operation was performed previously. Selecting Paste causes the copied control to be pasted into the current location. Properties – This brings up a properties form that can be used to edit the properties of the control. When the mouse is hovered over a control in the design area, the mouse icon will change from a ‘normal select’ icon to a ‘move’ icon. When this happens, you will be able to pick up and move the control by holding down the left mouse button. The control will be "dropped" when the mouse button is released.